While strong academics should be a priority, schools also need to offer programs that provide students with opportunities to broaden and deepen their sense of self and the world in which they live. Community service, experiential learning, character development, and leadership programs teach children the skills and strategies to be successful beyond the classroom. Every student has the potential to be a leader, and at St. Michael’s Country Day School, we intentionally teach leadership skills so every child is equipped with the skills needed to advocate, collaborate, and communicate effectively. We provide leadership opportunities throughout every student’s experience so they feel inspired and empowered to make a difference in their community and beyond. 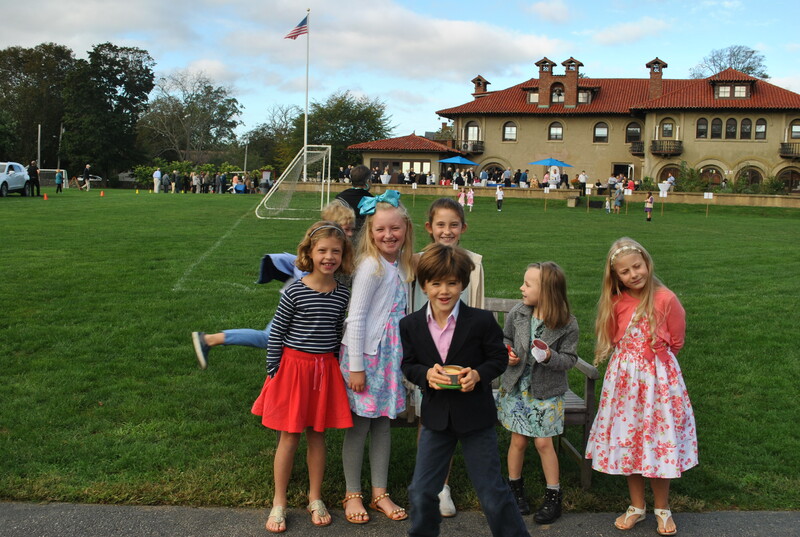 One of the many special qualities about St. Michael’s Country Day School is our strong sense of community. We therefore place high value on our Lower and Middle School connection. In addition to gathering as a full school once a month for an all-school assembly, we seek additional opportunities for Lower and Middle School students to get together to collaborate on projects, engage in community service, or just visit together. Not only does this collaboration build relationships, but it provides our older students with a chance to be role models for our younger students. Through Community Service, our students’ awareness of their responsibility for the community outside of St. Michael’s is enhanced and understood. Students develop a deeper appreciation for the greater community to which they belong and foster a personal responsibility to their neighbors by upholding the values taught at St. Michael’s. By looking beyond their own personal experience, St. Michael’s students experience empathy and become intrinsically motivated to do good in the world. In every grade level at St. Michael’s, students have the opportunity to experience public speaking. Whether it is presenting at an assembly, making announcements at morning meetings, standing in front of the class to share a project, or performing on stage, our students gain experience and confidence with public speaking. Teachers take their role as advisors seriously, and work with students to develop self-advocacy skills so they can learn to communicate effectively with peers and adults. The reality that all educators are facing is that we must prepare our students to live and thrive in a 21st century learning environment, which includes technologies and innovative tools that are rapidly changing the landscape of our schools. In order to have innovation, we must create a culture that celebrates out of the box thinking, creativity, and play. We want our graduates to be excellent communicators, critical thinkers, and creative problem solvers so that they can be successful in a complex world. St. Michael’s therefore incorporates into our curriculum inquiry-based and student-driven learning. When questions and challenges lead students through real life problems, they learn to take ownership of their learning, work with others, and advocate with confidence. When learning is authentic and focused on the real world, students are intrinsically motivated and passionate about learning and growing. At St. Michael’s Country Day School, we ask that teachers, parents, students and administrators demonstrate “Traits for Success.” Research indicates that these character traits play the most significant role in enabling students to achieve success in school and in later life. Such factors as reading levels, affluence, grades, and I.Q. do not correlate as highly with eventual success as Organization, Attentiveness, Courage, Generosity, Persistence, Positive Attitude, Flexibility, Collaboration, and Responsibility. Student Council is open to 7th and 8th graders. Student Council members oversee community spirit events celebrating athletic events and holidays, lead fun school contests and assemblies, and help promote and organize community outreach efforts. Student Council members learn how to advocate for change within the community by communicating effectively and collaborating with the adults in the school. The St. Michael’s Ambassadors is a program in which 8th grade students work with the Admission office to welcome and tour prospective families and visitors. They share their experiences at St. Michael’s with those interested in the program, as well as participate and speak at various admission events throughout the school year. The Ambassadors are led by Mrs. Welsh, Head of Middle School. Public speaking is an important skill to practice as our students move into the world beyond St. Michael’s, and we seek to empower each student with the tools to find success as speakers and leaders in the years ahead. At St. Michael’s, we hope to cultivate in our students the desire to seek out challenges, tackle fears, and take risks along their educational journey. The 8th Grade Reflections program provides an opportunity for each St. Michael’s eighth grader to address the middle school community. As leaders of the student body, our eighth graders exemplify the spirit of the St. Michael’s experience. Through personal story, their Reflections will share meaningful messages relevant to their fellow students. Students may choose to use their Ghandi essay, Past and Present Me, or This, I Believe essay; all written in English class. They may also choose to write an additional essay on a topic near and dear to them. This is a multi-step process that takes place throughout the 8th grade year. First, students learn how to write various types of essays and practice public speaking in English class. Then they work closely with faculty mentors to develop their ideas and write a compelling speech. The actual speeches will be two to four minutes in length. Multimedia is not an element in this presentation. Speeches are delivered in front of the Middle School student body during the school day, and there will also be an evening event open to parents and special friends. The high school placement process begins in the spring of the 7th grade year with an information session and kick off event. In conjunction with the high school preparation process, students will polish their leadership skills throughout their 8th grade year. They will learn about teamwork, group dynamics, communication, vision and action, and self-awareness.